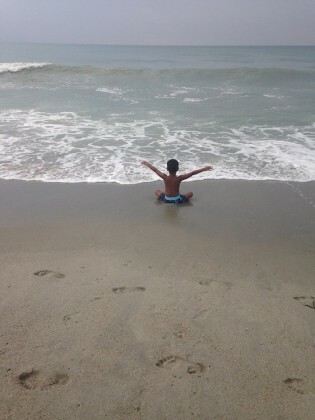 My son praising on the beach. “Do not be afraid; you will not be put to shame. Do not fear disgrace; you will not be humiliated. You will forget the shame of your youth and remember no more the reproach of your widowhood. For your Maker is your husband—the LORD Almighty is his name—the Holy One of Israel is your Redeemer; he is called the God of all the earth” Isaiah 54:4–5 (NIV). When I was single, I hated when people told me the Lord was my husband during that waiting period. I hated it even more as a young widow with two children. I love and worship the Lord, but the Lord couldn’t babysit the kids for me so I could get a break. The Lord couldn’t change any poopy diapers. The Lord couldn’t take out the trash for me. God is omnipresent, but the Lord couldn’t sit next to me in the movies or engage me in a conversation over the dinner table. Every time someone said that to me, I felt like they completely missed the point of my complaint as a widowed mother. In fact, when I heard other Christian women invoke this scripture, I’d cringe because I knew some of them were longing for husbands and all that comes with companionship, marriage and family. However, during this season of widowhood, the Lord is chipping away at my disdain for this scripture and showing me what it really means in my life. For example, when my husband died, many of the dreams I had for the future died with him. I thought to myself, “Oh well. I guess that will never happen, and we will never do this or go there.” In a way, I buried many of the hopes and expectations I had for my family with him. One of the dreams I had for my family was homeownership. My husband and I owned a home during our marriage, but after his death in the house, I couldn’t stand to live there. I moved out expecting never to own another home again. It felt like an impossibility to me. After all, it took a miracle to get into that house. A family friend loaned us the down payment and our joint incomes qualified us for enough money to get a decent house. Now, I was on my own with two children and I had just gotten fired from my job. Without a husband or income, how could I ever own a home again? Well, the Lord showed me this summer that nothing is impossible with God. Through nothing short of a miracle, the Lord enabled me to purchase a brand new home. It’s large enough for me and my children and in a great neighborhood. All I had to do to get it was take a leap of faith and step outside of my comfort zone. I always describe it as a “miracle,” but God corrects me saying He is just doing what He said He would do. He is our Jehovah-Jireh, our provider, He is “Abba Father,” the one who gives good gifts to His children. As a result, our living situation is finally stable, and we have a new home for our new start. Another complaint of mine since my husband’s death is the inability to go on family vacations. Of course, I could take my children someplace on my own, but it isn’t the same without my husband. I can’t tell you how much my heart hurts when I see families together taking trips. I feel so incomplete. It is also hard financially to go on vacation when there’s only one income. I’ve lamented about this all summer. The Lord showed me this isn’t an impossibility either. Last week, I made plans to meet my best friend and her family at the beach. They were on their annual family vacation, and I planned to stay one night and spend two days with them since I recently moved out of state and don’t see them often anymore. The hotel reservation for one night with a family discounted rate through my aunt who works for the hotel was a financial strain, but I wanted to take my children to the beach before the summer ended. Well, a few days after I made my reservation, my best friend called me and said her in-laws had an extra timeshare and that we could stay in it for free for three days. The children and I had our own brand new, modern apartment in a hotel sitting right on the beach. We also didn’t have to pay for any of our food. My friend’s in-laws cooked meals the entire time in their timeshare for everyone as part of their family vacation. All I had to pay for was the gas to get there and the gas to go home. God showed me again that with Him, nothing is impossible and He will give me the desires of my heart if I delight myself in Him and trust Him. Now, getting back to Isaiah 54:4-5, God is not saying you don’t need companionship or a husband when He tells you He is your husband. I believe God is saying to us like He was to the children of Israel when they were returning from captivity that although we’ve been barren and stripped of everything like a widow or wife with no children, He will restore back to us everything we lost and more. God is saying to us that the ruins of our lives will be replenished and that He will pick us up and redeem us as a husband does his wife. He can and will give back to us the years that the caterpillar, cankerworm and locusts have eaten. He will give us beauty for ashes. Nothing is impossible with God. Just believe. I’m finally getting it Lord. Thank you.